Plans are underway to repair Hancock Park streets with concrete. 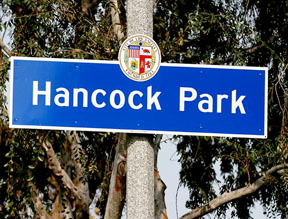 “We are delighted to be working with our new Councilman David Ryu to develop a plan to repair our streets and intersections with concrete,” said Cindy Chvatal, president of the Hancock Park Homeowners Association. The group’s Streets Committee met with Councilman Ryu and members of his staff last month to discuss the repair plan. The long-time in the making project will begin at June and Beverly, Hudson and Fourth and Las Palmas and Oakwood—the first three intersections to be repaired. Estevan Montemayor, communications director for the councilman said, “The Bureau of Street Services will survey to find two comparably damaged streets and put one out to bid to private contractors. The second street will be evaluated by BSS for costs and repairs,” to determine what the city would charge, he added. Meanwhile, the Greater Wilshire Neighborhood Council Transportation Committee launched a program also aimed at fixing streets and sidewalks. The Transportation Committee is teaming up with Councilman Ryu’s office to create a database of streets and sidewalks in need of repair within Council District 4, said Julie Stromberg, committee member. If you live within the Greater Wilshire area, send your requests for street and sidewalk repairs to transportation@greaterwilshire.org. Include your name, location of the sidewalk/street in need of repair, brief description, and a photograph. Please submit by Fri., Nov. 20. « Wilshire Rotary opens pumpkin patch on Blvd.